Our past few months have been filled with planes, trains and automobiles. 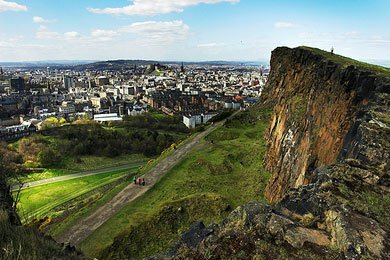 Seat (a hill outside Edinburgh) and a train ride to the Isle of Skye in the Scottish highlands. In late June we headed to the southern United States, I did some teaching at a training program for international pastors at Dallas Seminary; Linda attended the Gospel Coalition’s National Women’s Conference in Orlando. It was a grand adventure. But after going “there” we’re glad to be “back again.” Back to our home in the Shire of Cambridge. We are now preparing for the Fall and the upcoming school year at Heritage. Linda has officially started in a new position at the school. She’s been asked to head up the new Heritage Centre for Women in Ministry. She’ll be working with women students at Heritage, hosting occasional gatherings for pastors’ wives and helping run graduate courses designed for women. The first course (Women in Leadership with Dr. Bev Hislop) will run this fall. You can get more info on the course here or by emailing Linda at lreed@heritage-theo.edu. I’m gearing up for teaching preaching this fall and we are both preparing for speaking opportunities in the coming months (you can see our speaking schedule here). After taking some time off this summer, Linda and I hope to resume more regular postings on our blog. We’ll use this space to write about lessons God is teaching us, thoughts we have on life and ministry and updates on opportunities at Heritage. In a real sense, all of us who follow Jesus are on a grand adventure. We walk by faith, trusting God to keep our feet on the path and to use our lives to lead others in His way. This entry was posted in Ministry Matters, Personal. Bookmark the permalink.